Cat dander for anyone in your household with allergies can be a challenge. It's a constant struggle to keep bedding, floors and furniture fur free, which contain the dander that causes itching and sneezing. Most owners must take a daily allergy medication to cope. But there's ways to live in the same house with Fluffy without being miserable. There are a variety of high-energy particulate air (HEPA) filters on the market today that can reduce airborne pollutants in your home, including cat dander. They range in price from $50 to $550. The more expensive filters contain not only HEPA filters, but ionic and UV filters. These filters can usually clean a room in a few hours. However, if you can't afford the expensive brands, it's a good idea to purchase one for each room in your house. Remember to also change the vent filters regularly. Like HEPA filters, there's a variety of vacuums on the market that are specifically made to remove cat dander and venture deep into your carpet to reach those tough spots. Additionally, there are cleaners marketed to be allergy reducers. By cleaning and using these products on a regular basis, and washing the bedding of the allergy sufferer, you can reduce the risk of health issues. Many people develop allergies to cat dander later in life, especially women after a pregnancy. So getting rid of that part of your family is not likely a viable option. You've spent years cuddling with your fuzzy friend and the temptation to stop is hard. Vets recommend cat owners who suffer from this problem to take a daily over-the-counter allergy medication if their symptoms aren't bad and frequently wash their hands. 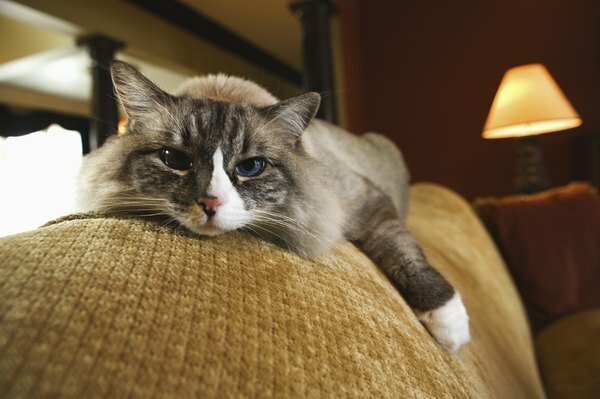 By scrubbing up after petting your favorite cat before touching your face, you can avoid red eyes and itchy skin. Many local pets stores sell special cloths, usually made of microfiber, that are made to help reduce cat dander. You can wipe Fluffy down with these products at least once a week. While your cat may not like this idea, as most don't, it's another avenue to help you and your loved one co-exist. If these cloths aren't available, a small damp towel will do the trick, too. fitsugar: Why Sudden Allergies In Adulthood? Can Birds Bathe While Being Sick?